Wondering what to do with those brown bananas that are starting to attract fruit flies? Well one concept is to peel them and freeze them for smoothies, but an even better idea is to make these breakfast bars from Gooseberry Patch. Mix your dry ingredients in one bowl: flour, sugar, baking soda, salt. In another bowl mash together the wet ingredients: bananas, shortening, eggs, vanilla. Next, combine the wet ingredients with the dry until the flour mixture is just moistened. Grease a 13″ x 9″ pan and pour the batter in, spreading out evenly. Bake in the oven at 350 degrees Farenheit for approximately 20 minutes. When cool, cut into squares and serve using a sifter to sprinkle fresh powdered sugar on top. Another topping option I didn’t make because I was out of cream cheese, and not feeling like a 20 minute drive to the store, is cream cheese frosting. All you need to do is cream together one package of cream cheese, a stick of butter, 2 cups of confectioners’ sugar and 1 tsp. of vanilla extract. Then top the frosting with chopped walnuts for an extra nutty crunch. I’ve never had banana bread this moist, fluffy or tasty before. The top stays sticky where the sugar seems to rise and sit. The inside is extremely light and fluffy, unlike most banana breads, which are a little dense. It’s not over-filling and makes a larger quantity than a small bread pan would. My mom suggested it needed walnuts, which, if you make it with the cream cheese frosting, would be the cherry topping of the sundae. It’s an easy, grab-and-go breakfast for the week. I was on my way to the grocery store to attempt a new mediterranean inspired “dip,” to spread on roasted vegetables when my mom’s friend insisted I come home. Turns out I’m on “mom” duty for the next week, so I attempted to make my mom an easy, healthy meal she didn’t have to chew. This also makes for a vitamin-rich, energy-boosting breakfast. 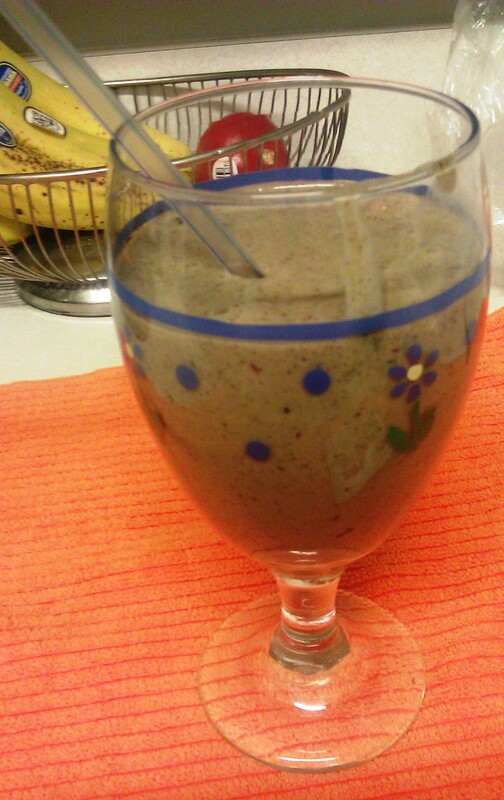 In a Magic Bullet or blender (I’m turning into a fan of the bullet. You just flip your blender upside down and automatically have a cup with a handle.) 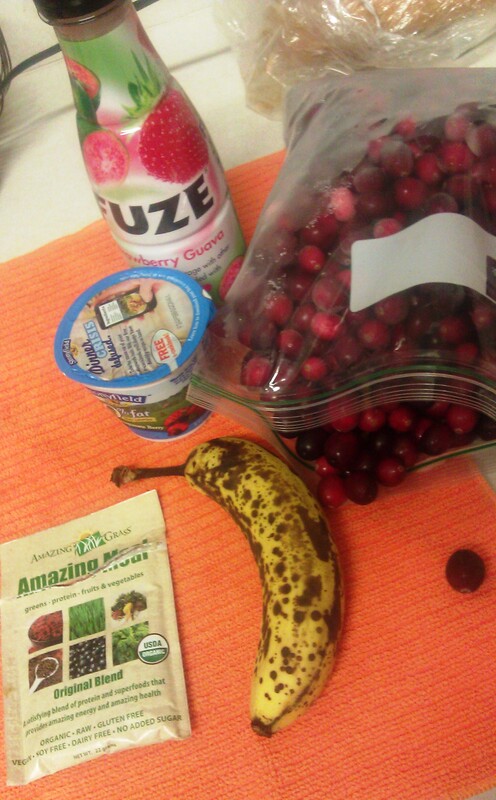 blend together the bananas, yogurt, Amazing Meal, a gulps worth of flavored Fuze to create a drinkable consistency, and your favorite frozen fruit for thickness. We’ve had these Amazing Meal sample packets sitting in the cabinet for quite some time, and what better time to boost your immune system with vitamins than when you are sick? Unfortunately, our frozen fruit abundance depleted and all I could find were cranberries which seemed like they’d be way to tart for a shake. They actually helped the overly sweet shake by adding a tart, heartiness. Pour in a glass and enjoy! And don’t let the “green juice,” as my younger cousin calls it, color scare you away. It was sweet and delicious. Overly sweet for my taste buds, but my mom loves fruit, in everything, including salsa. So she was pleasantly surprised by the fruity natural sugars and thickness that still fit through a straw. My mom found this recipe on Food Network’s website, and I have to say, who doesn’t love a good Paula Deen dish? They’re always loaded with lots of butter, heavy cream, and Southern love. Preheat your oven to 375 degrees Farenheit. This dish is really versatile and can be great for breakfast, lunch, brunch, dinner or linner. The real recipe calls for bacon instead of mushrooms, which would add a lot more flavor. I choose to add flavor with spices and by swapping in a stronger heartier cheese to mix with the swiss, which can sometimes be too pungent and leave a bad taste in your mouth for hours after. Shake it up and add tomatoes, broccoli, or any other additive. I absolutely love when pie crusts flake off and crumble like the Dominick’s brand we bought (Surprising, I know. The off brand was actually good.). That is the perfect density for a crust, and usually still holds together at the bottom. If you aren’t a pie lover, this will give you that same pie feeling without all the sweetness. This easy to make recipe will have your co-workers begging for more. Start by preheating the oven to 375 degrees Farenheit and grease an 8×8 baking pan. It only takes about 10-15 minutes to throw the ingredients to be cooked together, just enough time to get the oven nice and hot. In a mixing bowl, combine your dry ingredients for the cake: flour, baking powder and salt. In a separate bowl combine the wet ingredients: oil, egg, milk and brown sugar (okay this isn’t a wet ingredient, but it is heavy and when combined with the egg and oil will diffuse into a liquid). Gradually combine the dry ingredients in with the wet ingredients adding in a tablespoon of cinnamon. I used a fork to get a gentle whipped texture keeping the cake nice and light. The cinnamon will incorporate with the sugar creating a sweet spice. Stir until everything is blended. Carefully fold in the berries to you mix. If you are too rough, the berries will break open staining your cake. My mom likes to freeze berries when they are cheap and in season in individual sized glad freezer wrap. These turned out excellent for the cake because they are solid enough to not break open, but still fresh. Pour your mixture into the 8 x 8 pan making sure it evens out and set aside. In a small bowl, stir together the dry ingredients: flour, sugar and cinnamon. Add in the softened butter and mix until they are equally incorporated and form into small crumbles. You really want softened butter and not melted to get the correct form and texture of the topping. Sprinkle the sugary morsels onto the top of your cake mix in the 8 x 8-inch baking pan and place in the oven for 45 minutes to an hour. The cake will stop jiggling when lightly shaken from side to side when it’s ready. Stick a toothpick into the center. If it comes out clean, your cake is ready. Let cool in pan for 10 minutes before cutting into the sweet morning treat. The cake holds the perfect amount of moisture so every bite holds together and melds into your taste buds. The best part is the topping, so make sure to get some with every forkful. It brings more of that sweet spice from the sugar and cinnamon into the cake and when you get some with a berry, your taste palate is complete. Danielle passed along this healthy recipe to me after I snuck my hand into the package she was sending to her boy”friend” just to get another taste of this crunchy adoration. I demanded the recipe only to find out it is quite easy to make. In a saucepan combine the wet ingredients: butter, peanut butter, honey, vanilla extract, and sugar until they are well melted and melded together. In a large mixing bowl combine the dry ingredients: nuts (I chose to just buy mixed nuts as they were the cheapest, but the actual recipe calls for a cup of almonds and a cup of pecans), granola, rice krispies, and wheat germ or bran. Pour the wet ingredients over the dry ingredients and coat them together. You can then either drop the mixture in clumps on an ungreased baking sheet or spread them evenly over the pan and cook until the edges are brown. Cook at 270 degrees. These treasures will have you full in a flash, which is perfect for a quick breakfast or snack on the go. I was making myself more sriracha popcorn (which by the way makes your eyes water from heating the chili peppers inside). They have just the right amount of nuttiness from the mixed nuts (better with almonds and peacans). The sweetness from the honey is just right, not too much like sugar, but perfect blend with the peanut butter. These aren’t too crunchy where your teeth break like some granola’s. I’ve been eating it for breakfast for the past two weeks.